With only one month remaining in the NHL season, the past week had no shortage of excitement on the ice. Individually, superstars such as Steven Stamkos and Evgeni Malkin succeeded, continuing to build up their leads in the goal and point categories. However, the most important part of the past 7 days was the substantial changes in the playoff picture. In the Eastern Conference, the Buffalo Sabres rode the coattails of Ryan Miller’s back-to-back shutouts, and the Tampa Bay Lightning managed to put them back into contention. However, the Toronto Maple Leafs had an abysmal week, losing on Tuesday and Wednesday to hamper their very slim chances. In the Western Conference, the very close race for the final playoff spots became even tighter. The Dallas Stars continued to play very well, while the Calgary Flames had a less than stellar week. Overall, the days consisted of nonstop action and playoff implications. However, what happened in the games and off the ice was much more entertaining than the overall results. Ranging from a gutsy goal, to trade talk, to a coaching change, there was no shortage of excitement. Here is “The Week That Was” from February 26th to March 3rd. Unless you were living under a rock for the past 3 weeks, the 2012 NHL trade deadline occurred on Monday. For months, sports outlets such as TSN and Sportsnet were hyping up the day, with day-long coverage and teaser commercials. To add fuel to the fire, Rick Nash appeared to be on the trading block and James Van Riemsdyk was healthy once again. However, when the day came it was a massive disappointment. Only 16 trades, many of which were minor, and Rick Nash remained in Columbus. However, there was one clear winner and one clear loser. What Did They Gain? Andrei Kostitsyn, Paul Gaustad, and Hal Gill. What Did They Lose? Draft Picks, including their 2012 1st. Why Were They Winners? The Nashville Predators did not acquire any big names prior to the deadline, but they added players that will solidify their chances at making a deep run in the NHL playoffs. By adding Andrei Kostitsyn and Paul Gautstad, the Preds addressed their need for more depth up front, an issue that haunted them against the Vancouver Canucks last year. Also, the addition of Hal Gill will take some of the heavy load off of Shea Weber and Ryan Suter, and take some time off of the penalty kill. Why Were They Losers? The Chicago Blackhawks have been incredibly disappointing over the past few weeks. With this underwhelming season, the team’s main focus was to improve the defense and add an extra center. However, instead they got rid of a very tough presence in Scott, and only acquired an average blueliner in Oduya. The inconsistent goaltending and lack of center depth down the middle was not addressed, and it seems that the team will not make a very deep playoff run this season. In today’s society, we as fans expect complete insider information. Rounding up trade rumours and following hockey insiders is a part of the daily routine of many fans’ lives. However, it is very rare that much information is leaked, aside from a few tidbits of information. However, Blue Jackets’ general manager Scott Howson decided to drop a bombshell of insider info, which was perhaps too much to handle. In a press conference after the trade deadline, Howson announced publicly that captain Rick Nash approached him, asking for a trade. In an instant, the criticism started to emerge. On one side of the argument, Rick Nash was faulted for asking for a trade, and that he signed an 8 year deal to remain in Ohio. However, the more vocal argument was that Howson’s decision to make Nash’s request public was idiotic, and to betray the captain like that is inexcusable. While this might be sorted out in the summer, what occurred on Monday was odd, and a sort of press conference that is not seen every day. In the NHL, there are some very dangerous jobs. Players can fight other players with their fists, forwards need to watch out for impending bodychecks, and goaltenders have to stop slapshots upwards of 90 miles an our. However, some feel that there is no job in hockey that is less safe than that of the head coach. Mentally, it is an incredibly pressure-filled position that can result in being let go at any time. That was evident on Friday night. 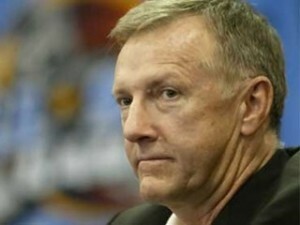 After the dinner hour, multiple people found out that Toronto’s head coach Ron Wilson was fired after 4 unsuccessful years. In this case, it was shown that the security of a coach is constantly changing, and their tenure could be over with little warning. However, when people comment on the danger of being coach, they don’t mention the physical danger involved. However, this season we have already seen Oilers’ coach Tom Renney sidelined with a concussion, and Sabres’ coach Lindy Ruff break multiple ribs. Another scary incident occurred on Sunday, when San Jose Sharks’ coach Todd McLellan suddenly was knocked down during his game against the Wild. Many feared that he had suffered a medical condition, but replays showed that he was hit in the head with a stick. Fortunately, McLellan was okay. However, this incident yet again shows how rough it can be it can be to coach an NHL team, and that both tough skin and tolerance to pain are needed. In the last issue of “The Week That Was”, the common theme was the unusual injury. For this issue, the theme is the wide variety of mis-plays that occurred. The first happened on Tuesday night, when the Ottawa Senators visited the Boston Bruins at the TD Garden. Up 1-0, forward Erik Condra had a wide open net to extend the lead, but missed the open cage. Regardless, the Senators managed to hang on to the 1 goal lead and win the game. The other 2 both took place on Thursday night in the same game, and were a part of every hockey highlight show in Canada. The first of these 2 plays involved hard-hitting defenseman Alexei Emelin, going in for a hard check on rookie Nick Johnson. However, Johnson evaded the hipcheck, causing Emelin to go flying into teammate Erik Cole. Cole would be fine, but the hit was arguably the nicest of the week. The other blooper came in the shootout, when Wild forward Devin Setoguchi stumbled in the shootout to secure Montreal the victory. You can watch both of these unfortunate plays here. In every NHL game, teams involve themselves in gutsy plays. These plays can be as simple as pulling the goalie for an extra attacker, using 5 forwards on the powerplay, or tape-to-tape passes up the middle of the ice. However, there is a difference between a risky play and a stupid play. A stupid play is what happened on Thursday night, when the Winnipeg Jets demolished the Florida Panthers 7-0. Up by 3 in the 2nd, the Jets went in on an odd man rush. However, this was no ordinary odd man rush, as every player wearing navy blue headed to the goal. In a remarkable 5-on-1 play, Brian Little received a pass and snuck it by Theodore to give the Jets another goal. While the play was exciting, it was incredibly moronic. Had it hit the pad of Theodore, the play would have been a 3-on-0 the other way, potentially cutting the lead to 2. Winnipeg should be careful, as doing that against teams such as Boston or Pittsburgh would not end well.